It’s time for summer fruit crisps — cherries, peaches or berries baked with a buttery crunchy topping. When I developed this wheat-free recipe for a client, I experimented with quinoa flakes* which look a lot like quick oats but are more flaky. I liked the crispy light texture of quinoa flakes, but also wanted a more common option. With a little experimenting I found crushed cornflakes worked great too. So use quinoa or cornflakes, and try any of your favorite fresh or frozen fruits in this super simple crisp. Combine cherries, sugar and lemon juice in a bowl. Stir to mix well. In another bowl, mix oats, quinoa or cornflakes, brown sugar, almonds, butter and cinnamon until evenly blended. 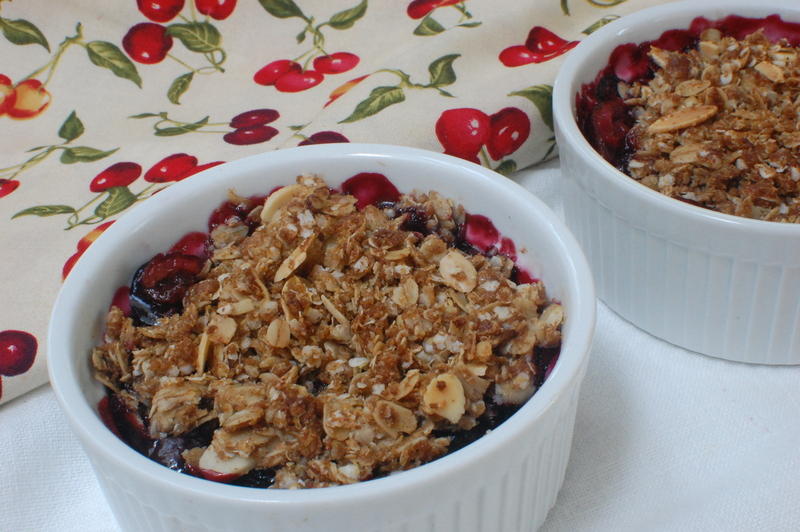 Divide cherries between 6 eight-ounce ramekins or use a 1-1/2 to 2 quart-size baking dish. Sprinkle evenly with crumb topping. Bake 35-40 minutes for ramekins, 40-45 minutes for baking dish. Serve warm or room temperature. – *Look for quinoa flakes in the cereal or health foods section of well-stocked supermarkets. Ancient Harvest is the brand I found. 12oz box $5.69. – If fruit is very juicy, stir in 2 teaspoons cornstarch with sugar and lemon juice to lightly thicken juices. Olson’s Cherries are an institution! They are the best in Silicon Valley, I remember it was very special when I was growing up to buy cherries there. The crisp looks super yummy. Thanks for the recipe. Think I’ll make it tonight–got lots of cherries. This recipe looks and sounds delicious! Where would I find Quinoa flakes? I have never seen them. You should be able to find the flakes where quinoa grain is sold, usually in the health foods section of regular supermarkets, or in the cereal section. It’s a bit expensive – I paid $5.69 for a 12oz box which is why I like the cornflakes option. I’ll add a link to Ancient Grains Quinoa Flakes on the post. I’m on the hunt now for quinoa flakes. I probably will need to head over to Reno to find them, but this looks so good right now with cherries all over the place.